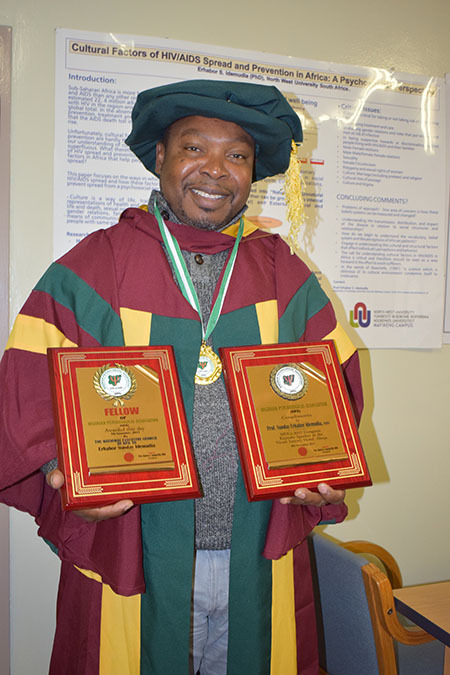 Erhabor, a research professor in the Faculty of Humanities at the North-West University’s (NWU’s) campus in Mahikeng, was awarded the fellowship at the International Congress of the NPA, held in Abuja, the commercial capital of Nigeria, from 2 to 12 November 2017. During the conference, he also gave a keynote address titled, “Bad governance and the burden of youths: Implications for African migrants in Europe”. The theme of the congress was “Psychology, attitude change and national development”. This is not Erhabor’s first award. He has also bagged the 2016 Georg-Foster Lifetime Achievement Award from the Alexander Humboldt Foundation in Germany, where he collected data from African migrants in six European Union countries. In September this year, he delivered another keynote address, this time at the FUOYE Humboldt Congress, where he spoke about “The Convergence of Qualitative and Quantitative Research Approaches in Social Science Research”.